DUNDEE--The Dundee girls varsity basketball team topped Clyde-Savannah, 47-29, Friday, Nov. 30. Megan Sutherland led with 13 points, four rebounds, and two steals. Mackenzie Strait had 12 points, six assists, three rebounds, and three steals. Hallie Knapp added 10 points, six rebounds, and two blocks. Makenzie Cratsley posted seven points, four assists, and seven rebounds. Alyssah Newell scored three points, with five rebounds, while Dalaine Nolan had two points, two assists, four rebounds, and three steals. The Lady Scots fell to Hammondsport, Tuesday, Nov. 27. The final score was 60-48. Strait had 18 points, five assists, and six steals. Cratsley had 16 points, four assists, seven rebounds, and four steals. Sutherland added eight points, followed by Newell and Nolan with three points each. The Dundee boys varsity basketball team lost to Hammondsport in the opening game of the season, Friday, Nov. 30. The final score was 56-44. Austin Gibson scored 16 points, followed by Michael Hand with 10 points. Peyton Boudinot and Brandon Edmister both earned five points. Preston Cratsley had four points. Nick McCurry posted three points. The Scots' varsity wrestling team finished 10th at the Avoca Duals, Saturday, Dec. 1. Dundee suffered losses to Alfred-Almond, 42-21; Arkport, 54-6; Williamson, 59-6; and Hornell, 54-18. Dundee's team beat Campbell-Savona, Thursday, Nov. 29. The final score was 31-30. Julian Heavner-Ortiz (138 pounds), Kenneth Empson Jr. (170), Leif Hoyt (220) and Harry Nice (285) all won with pins. Michael Eaves (99) won by forfeit. The Dundee varsity bowling teams both topped Harley Allendale Columbia, Wednesday, Nov. 28. The boys won, 4-0. Hunter Murphy had a 601. Connor Muck added a 593, while Stephan Smith had a 560. Matthew Pollack posted a 319. The girls won, 3-1. Mercedez Roy led with a 417. Jaedyn Brewer posted a 313. Edele Morgan followed with 295 in two games. Sam Hunt had a 270 also in two games. The Scots' boys varsity bowling team blanked Honeoye, 4-0, Tuesday, Nov. 27. Smith posted a 570. Muck added 441. Pollack earned 328, while Ridge Wright had a 311. The girls won, 3-1. Roy had a 418, followed by Hunt with a 369. Brewer posted a 319. 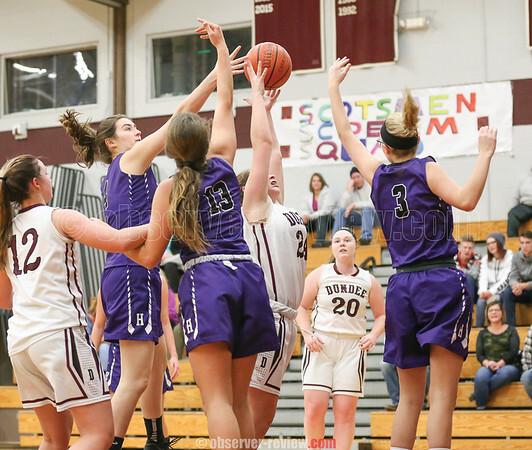 HAMMONDSPORT--The Hammondsport girls varsity basketball team lost to Romulus, 47-40, Saturday, Dec. 1. Ana Salom scored 12 points, with eight rebounds, three blocks, and four steals. Destiny Hammond had 11 points, five assists, six rebounds, and five steals. Tea' Flynn added 10 points, four assists, eight rebounds, and three blocks. McKenzie Boscoe had six points and five rebounds. The Lakers' basketball team fell to Whitesville, 52-43, Thursday, Nov. 29. Hammond posted 18 points and eight rebounds. Salom had eight points, 12 rebounds, and three blocks. Flynn added six points and eight rebounds. Boscoe earned four points, five assists, and 10 rebounds. Maddie Sprague also scored four points with three rebounds. Hammondsport beat Dundee, Tuesday, Nov. 27. The final score was 60-48. Hammond and Salom both scored 16 points. Salom also had 10 rebounds. Boscoe added 10 points and four rebounds. Amanda O'Donnell, Sprague, Jillian Underhill, and Flynn each earned four points. The Hammondsport boys varsity basketball team topped Dundee, 56-44, Friday, Nov. 30. Parker Watson scored 27 points for the Lakers, with five steals. CJ Hill added 15 points and 10 rebounds. Byron Stevens posted six points and four rebounds. Johnathon Wells had five points and eight rebounds. The Lakers lost to Romulus, 45-32, Wednesday, Nov. 28. Watson led with eight points and five rebounds. Noah Wilkinson posted seven points, while Wells had five points. Both had four rebounds. Ian MacDonald and Alex Davis both earned four points. PENN YAN--Penn Yan's boys varsity basketball team defeated Marcus Whitman in a home game, Saturday, Dec. 1. The final score was 52-47. The Mustangs topped Haverling, 66-40, Thursday, Nov. 29. Conner Fingar and Peter Nicholson both scored 12 points. Peyton Schuck followed with 10 points. Brennan Prather and Mason Kuver each had eight points. Kyle Berna added seven points, while Devon Gerhardt had six. Penn Yan's girls varsity basketball team topped Marcus Whitman, 42-25, Friday, Nov. 30. Leading the Lady Mustangs were Ashley Sisson and Peyton Comfort with 12 points each. Sisson also added seven rebounds. Haylea Langan scored six points, with 10 rebounds. Jenna Curbeau added four points, five rebounds, and seven steals. Jammie Decker had two points, four assists, and two rebounds, while Hayley Andersen posted two points and two rebounds. The Marcus Whitman/Penn Yan varsity wrestling team took second in the Avoca Duals, Saturday, Dec. 1. The combined team lost in the championship final to Hornell, 54-30. The Penn Yan boys varsity bowling team beat Newark, 4-1, Tuesday, Nov. 27. Cameron Bassage bowled a combined 701. Jon Mashewske had a 608. Zach Gurba posted a 584. He was followed by Ben Broome with a 362 and Connor Harmon with a 318 in two games. The girls fell, 5-0. Emilie Thomas led with a 551 total. Emily Augustine posted a 537, while Kari Ayers had a 520. ODESSA--The Odessa-Montour boys varsity basketball team lost to Avoca 68-63, Friday, Nov. 30. For the Indians, Paden Grover scored 22 points. Zach Elliott had 14, followed by Devon Mahaney with 13. Grover also had 14 rebounds and Elliott 11. Mahaney recorded eight rebounds. The boys basketball team defeated Trumansburg, 38-29, Tuesday, Nov. 27. "We did a really nice job defensively through three quarters in holding them to 12 points," said Coach Matt Johnston. "(Trumansburg) can be an explosive offense as we saw with them scoring 17 in the fourth quarter. Offensively we missed some easy shots, but we will get better at those as the season moves on." Mahaney led with 13 points and seven rebounds. Elliott added eight points and 12 rebounds. Grover earned five points. Preston Harris and Jared Rumsey both scored three points. Deshawn Johnson, Derrick Lewis, and Ryan Griswold all added two points. The Indians' girls varsity basketball team beat Addison, 63-27, Thursday, Nov. 29. Sara Gardner led with 15 points, followed by Olivia Grover with 13 points, eight rebounds, four assists, and four blocks. Lexi Saunders scored 11 points. Kara Reese and McKennah Lott both had five points. Kennedey Heichel added four points, five steals, and five assists. Grace Vondracek and Jolynn Minnier each also earned four points. "We played great defensively tonight and that created a lot of scoring chances for us on the offensive end of the floor," said Coach Greg Gavich. "A good season opener all in all." Odessa's boys varsity swim team defeated Lansing, 101-55, Wednesday, Nov. 28. Brett Walters won first in the 200 IM (2:30.53) and 100 backstroke (1:08.51). Bailey Hornbrook took first in the 50 freestyle (26.87) and 100 freestyle (1:02.48). Johnny Neidermaier finished first in the 100 butterfly (1:20.28). Micah Brewster placed first in the 500 freestyle (6:54.08). The Odessa-Montour boys and girls bowling teams faced to Elmira Notre Dame, Friday, Nov. 30. The girls tied, winning the second and third games. Pixie Kinner recorded a 588 and Jackie Vincent a 561. The boys lost. Eric Rumsey led with a 482 and Colton Chapman followed with a 402. Odessa faced Edison, Tuesday, Nov. 27. The girls swept while the boys fell. Vincent led the girls with a 609 and was followed by Jana Arias with a 415. Rumsey led the boys with a 571. WATKINS GLEN--The Watkins Glen girls varsity basketball team beat Dryden in the season-opening game, Friday, Nov. 30. The final score was 51-18. Taylor Kelly scored 19 points, with two rebounds and two steals. Danielle Leszyk had 13 points, including three three-point shots, two rebounds, and two steals. Hannah Morse posted six points, three rebounds, seven steals, and eight assists. Ali LaMoreaux earned five points and five rebounds. Jena Slater, Kelsey Kernan, and Kathleen Clifford all scored two points. The Watkins Glen varsity indoor track team competed at SUNY Cortland, Saturday, Dec. 1. Kaylana Rekczis set a new Watkins record in the 1500 meter race walk with a time of 8:14.45 replacing the previous record held by Laura Flood with a time of 8:26.63. The Watkins' boys varsity swim team was beaten by Waverly, 124-58, Thursday, Nov. 29. Daine Butler was second in the 100 breaststroke (1:25.80) and third in the 200 IM (2:58.12). Nathaniel Wickham placed second in the 50 freestyle (24.93) and third in the 100 butterfly (1:23.01). Georgio Fazzary took second in the diving event, while Gabe Santos followed him in third. Scott Brubaker finished second in the 200 IM (2:53.39) and third in the 100 breaststroke (1:28.89). Collin Gaylord was third in the 200 freestyle (3:01.48) and third in the 100 freestyle (1:16.40). Clint Craven was third in the 500 freestyle (8:32.59).